We made this announcement via email Monday, and we have a couple of pallets left. Call if you’re interested! “Stuff happens” in manufacturing. Every beverage producer and every other manufacturer knows that it’s a problem when the production team doesn’t follow instructions on a project. Sometimes, though, it’s a problem when they follow instructions too literally. “Stuff” Happens! Especially in a custom manufacturing environment. “Stuff happened” to us recently when we ordered some unprinted (plain) can trays from our Texas can tray manufacturer. Sure enough, the plant followed our instructions and we got plain trays! And just to be sure everyone knew what they were getting, they printed PLAIN TRAY on every one of them. All 15,000 of them. Of course, at that point, our plain trays weren’t really plain anymore. When we found out what happened, we fixed it quickly and got our customer plain trays that really were plain. However, we now have about 10 skids of printed PLAIN TRAYS on our floor. We could just grind up those trays for the recycler, but we hate waste, and don’t want to do that without them even being used. They’re perfectly functional can trays in 200# Mullen board (a step up from the usual 32ECT), and we don’t want to send them to be repulped without being used. Therefore we’d like to get rid of them as soon as possible and recover a little more on them than we otherwise would as scrap. So, we have discounted PLAIN TRAYS for cans while supplies last! In order to get these off our floor without grinding more than a ton of perfectly good (but imperfectly printed) board, we’re offering this special program until they’re gone. We’ll accept orders as small as one pallet (1500 pieces) (that’s substantially lower than our usual minimum quantity of 3000 pieces, even for longer-run trays), and we’ll ship any multiple of 1500, up to whatever’s left). Pricing is FOB our Texas manufacturing plant; we will ship these with the lowest responsible carrier. Custom-printed trays, special size trays, and other corrugated cartons and displays are also available. 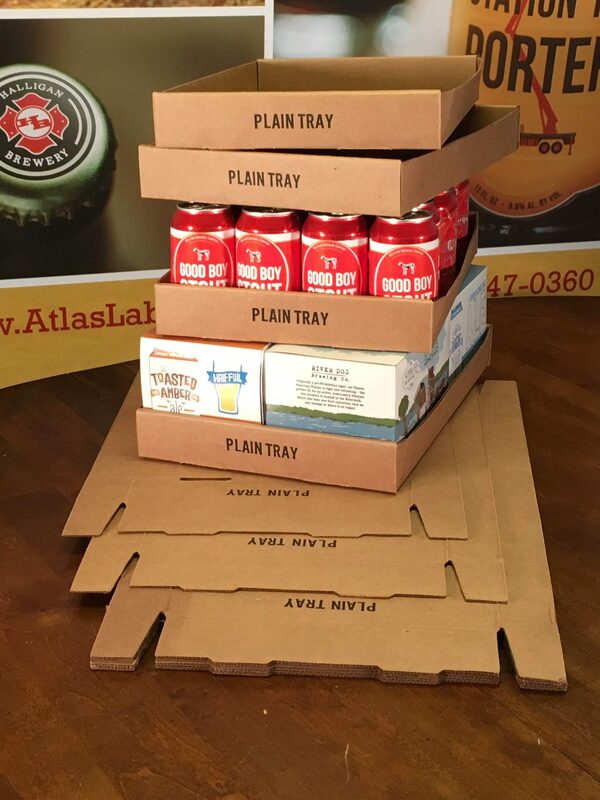 Of course we’d be delighted to work with any customer on custom-printed trays for standard 12-oz and 16-oz cans, long-neck bottles, and heritage bottles. We have standing dies for each of these items, and we can do a custom size to meet your special needs. Please give Atlas a call to get your next project started.